Martin Erat had a goal and two assists, and Pekka Rinne stopped 31 shots as the Nashville Predators broke out of a season-long scoring slump with three first-period goals on their way to a 6-1 win over the St. Louis Blues. 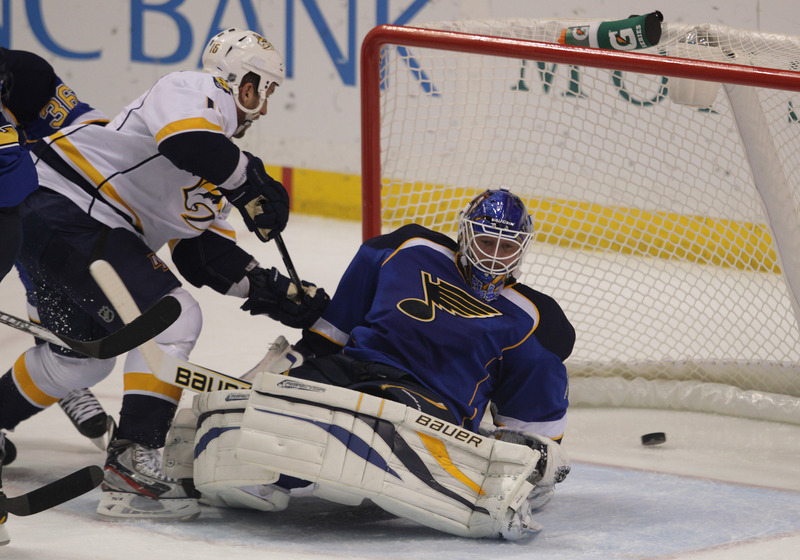 Ryan Ellis, Rich Clune and Nick Spaling scored in the first period for Nashville, which won its third in a row. The Predators entered with an NHL-low 12 regulation goals in their first eight games. The Blues dropped their second straight game. Nashville scored three times on its first eight shots against Brian Elliott. Ellis scored on a power play 2:10 into the game on assists from Wilson and Erat. The goal snapped the Predators’ scoring drought of 184 minutes, 54 seconds in St. Louis dating to Dec. 30, 2011. It also halted an 0-for-17 skid on the power play. Clune and Spaling scored 3:20 apart late in the first period to push the lead to 3-0. Elliott, who gave up four goals on 11 shots, was replaced by rookie Jake Allen midway through the second period. Kevin Klein and Gabriel Bourque added second-period goals to put the Predators in front 5-0. Alex Pietrangelo scored a power play goal in the second period as the Blues had a number of chances late in the period to cut into the lead, but Rinne was equal. The Blues outshot the Preds 10-0 over the final ten-plus minutes in the second. The Predators entered averaging a league-worst 1.5 goals per game. The Blues, which beat Nashville 3-0 at home on Jan. 24 and 4-3 in Nashville on Jan. 21, lost its second straight after winning four in a row.